The French aristocrat and well-travelled diplomat, Benoit de Maillet is the author of the earliest evolutionary text in modern times. In a posthumously published book (the title, Telliamed, is the author’s name spelled backwards), de Maillet proposed that all terrestrial plants and animals were derived (transformed) from marine ancestors. The book is structured as a series of three speculative conversations between a French missionary and an Indian philosopher. In these conversations, De Maillet drew upon his extensive geological observations, his belief that the sea level was universally falling, and anecdotal evidence from many ancient and contemporaneous works of natural philosophy. De Maillet’s highly polyphyletic version of evolution and the origin of terrestrial life was influential among French naturalists as a work of materialist philosophy. In Telliamed, the Indian philosopher, although portrayed as relating a fantastical tale to an incredulous French missionary – a device which makes the philosopher’s speculative views appear innocuous – actually represents De Maillet’s own sense of an evolutionary world. 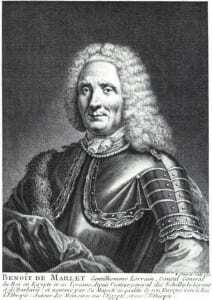 De Maillet is thought to have written the original text while serving as the French consul to Egypt in the early 1720s. Subsequent manuscript editions were subjected to significant modification by his editor the abbott Jean Baptiste de Mascrier. The work was not published until 1748, a decade after De Maillet’s death; and in many ways, the published text deviates from the original manuscript. De Mascrier’s edited version of Telliamed was quickly disseminated to the English-speaking world, where it was translated and published in London in 1750, only two years after its original publication. This same translation was then re-published in Baltimore, Maryland in 1797. De Maillet’s transformist system of nature is situated within the context of his geological belief in a 2-billion-year-old Earth. As seas receded and terrestrial environments emerged, marine animals adapted (became transformed) to land. De Maillet believed that for every land animal, there is a “similar or closely related species in the sea” (184). He envisioned one possible transformation – that of the flying fish into the bird – and concluded that every species of bird had evolved from a corresponding fish with the “same form, color, and habits” (188). In the case of the flying fish which is accidentally confined to land, De Maillet imagined that a metamorphosis of its body structure could take place so its fins were transformed into wings (187). It is not clear whether de Maillet envisioned such transformations occurring in a single generation or over many successive generations. It is evident that his transformist views were inspired by examples of metamorphosis occurring in the lifetime of a single organism (e.g., caterpillar to butterfly). De Maillet admited that some traits, such as speaking and writing, would take multiple generations to acquire. In speculating on the evolution of humans he wrote, “If males and females of these Orans-outans [Orangutans] had been captured…and had given birth to offspring among us, do you think Sir, that it might have been impossible, through a couple of generations, to make them capable of using a true language and reaching a more perfect shape than they originally had?” (202). For De Maillet, correspondence of bauplan between sea and land organisms and the presence of life on remote islands were strong evidence that modern terrestrial life began in the sea (like several other early evolutionists, he vastly underestimated the effects of long distance dispersal to oceanic islands). He also thought that an animal’s habitat and ecology were important predictors of the marine species from which they had evolved. On the origin of life, it is worth noting that De Maillet believed that the germs of different types of species existed in space: “the seeds of all life already exist in the universe” and that new species could still come into being: “The globe we live on has certainly shown to us only a portion of the species of animals, trees, and plants whose seeds are contained in the surrounding air and sea, and we cannot doubt that the future centuries will reveal new and unknown ones” (228).